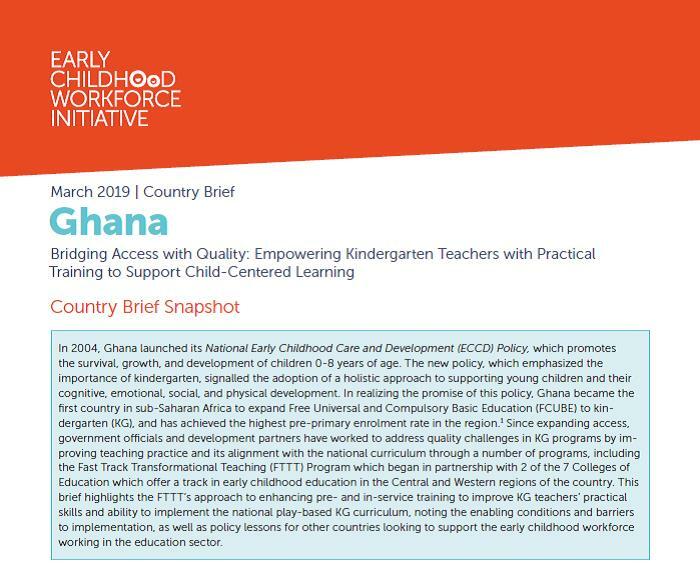 Our award winning Fast-Track Transformational Teacher Training (FTTT) project has been featured by the Early Childhood Workforce Initiative as one of their recent country briefs, highlighting efforts to support the early childhood workforce across different geographies and services. Despite mounting evidence on the positive link between high quality early childhood development personnel and the physical, social, and cognitive development of young children, the workforce continues to face challenges such as inadequate training, low remuneration, and a lack of professional recognition. The Early Childhood Workforce Initiative country briefs bring to light these challenges and potential responses to them, including promising policy and programmatic examples in action.